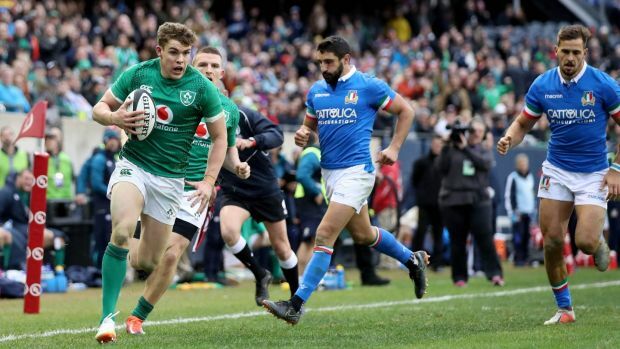 He may have flown in from Chicago at 7.0am on Monday following enough in-flight turbulence to keep players unsettled, but Garry Ringrose hopes to be one of Joe Schmidtâs settled selections for Irelandâs second autumn Test against Argentina on Saturday evening. âObviously you want to be out there and play. Any player wants that. It will be interesting to see,â said the outside centre, who scored one of Irelandâs eight tries in their 54-7 win over Italy in Soldier Field. Argentina are a team Ringrose believes have improved. While they have not been able to perform week in week out and consistently back up performances in the Rugby Championship, they always carry threat. The South American side won two from six in this yearâs Southern Hemisphere competition, beating South Africa 32-19 and also winning against Australia in Brisbane. Obvious threats such as outhalf Nicolas Sanchez and their relatively new wingers Matias Moroni and Bautista Delguy have been at the forefront of Argentinaâs wins. âIt was obviously a tough introduction when they first came in but I think you see year on year improvements and they keep bettering themselves with the type of rugby they are playing and the games are getting closer,â said Ringrose. âTheyâre a team that certainly are battling amongst the top teams in the world. It can be tough to back up week on week against the opposition they are playing. With Ringrose, Robbie Henshaw and Bundee Aki vying for starting positions, Schmidt will have to make hard choices. A secondrow with Tadhg Beirne, Iain Henderson, James Ryan and Devin Toner might be a more difficult discussion, but the selection headaches are a growing watermark of Irelandâs depth. Ringrose also arrives back at base with a mix of satisfaction but some lessons learned too. Despite the landslide 50-point win he is not inclined to get carried away. âWe took a few lessons from the first half,â explained Ringrose. âWe probably didnât play at the tempo we wanted to and thatâs in our control, how quickly we can speed the game up. Importantly Ringrose had pitch time with Aki to further build a playing relationship. It was the Connacht centre who put Ringrose through for his second-half try, Ringrose running an intelligent line off Akiâs right shoulder. âItâs great to get a chance to play with him,â he said. âIâve played a couple of times with him now and obviously he has the physical aspect to his game but heâs a brilliant footballer so heâs good to play outside of.